The Ben-Hur trailer was produced from 1941 to 1945. 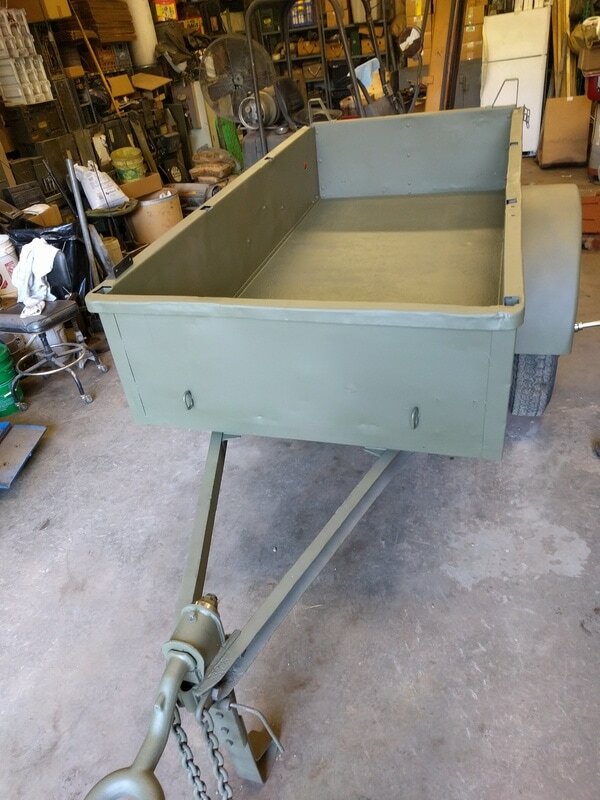 Originally towed behind a CCKW, these popular trailers were used to haul supplies during the war effort. 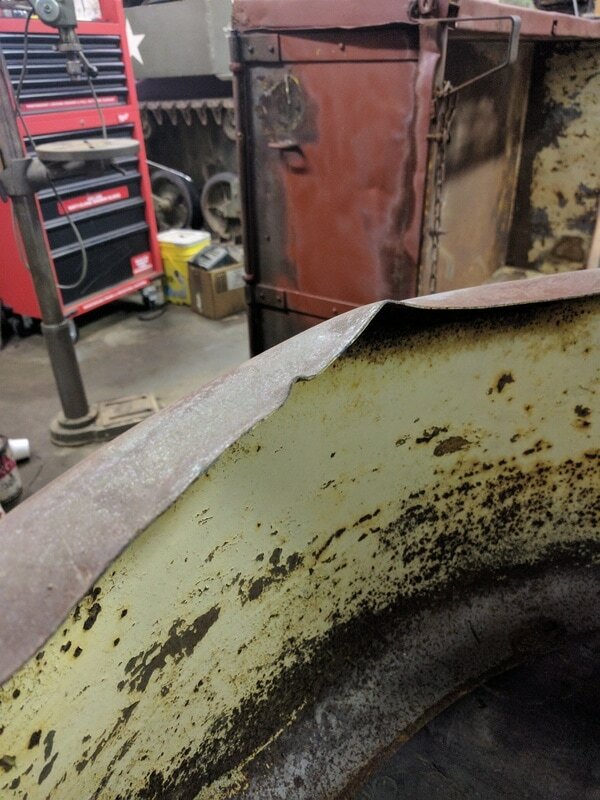 This one is in rough shape, but we can bring it back into service! 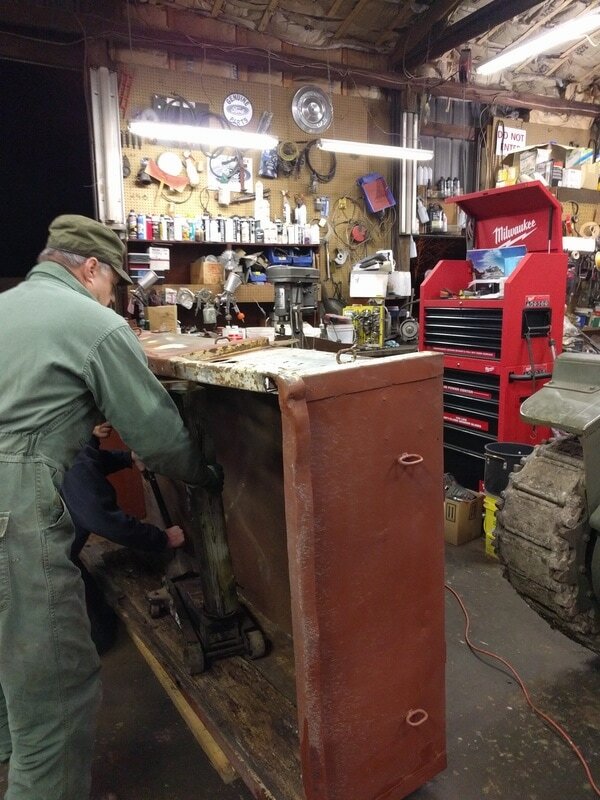 The G-518 is moved to the tank barn. It pulls pretty nice, but I took it easy due to the unknown condition of the wheel bearings. Just look at all the different paints that have been applied to this trailer. It must have served many people for many years. 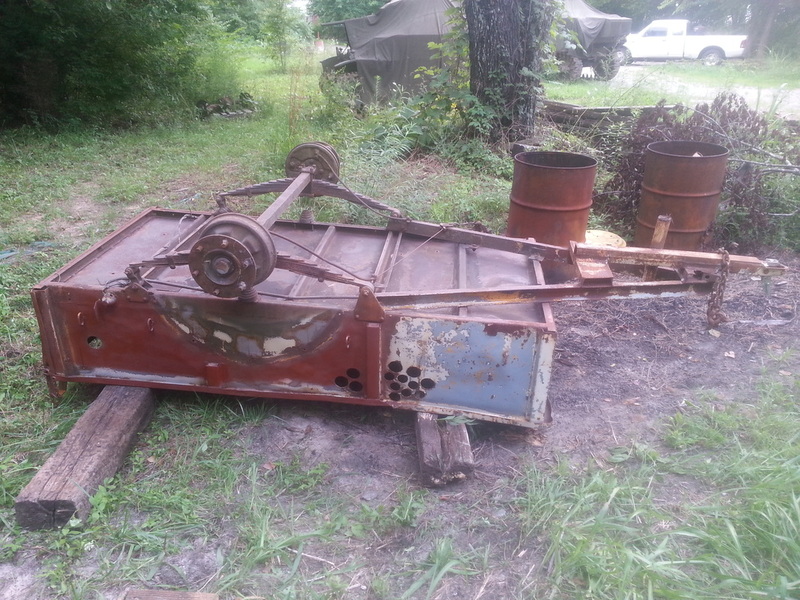 Some WW2 items live in a museum, some in a junk yard, and some are still used. This one came from a farm that was being sold off. Sandblast time! 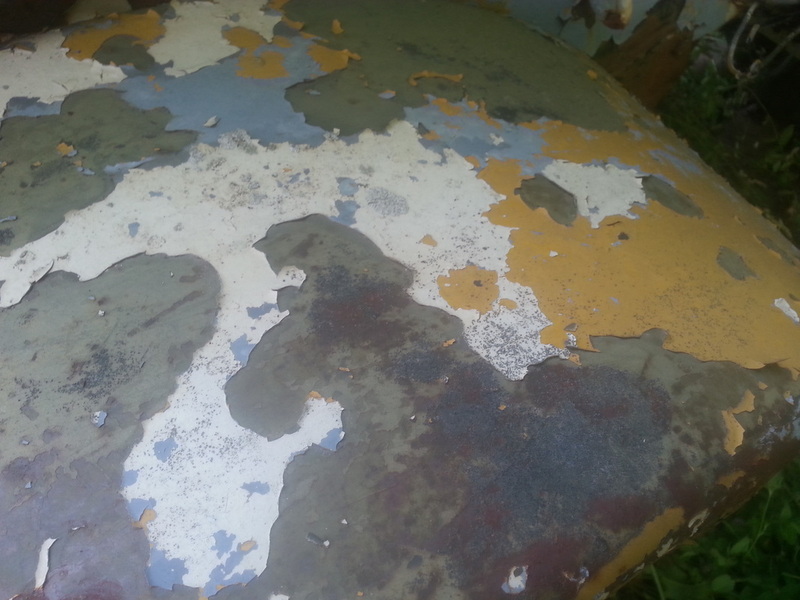 The old paint and rust comes off to reveal the original metal. 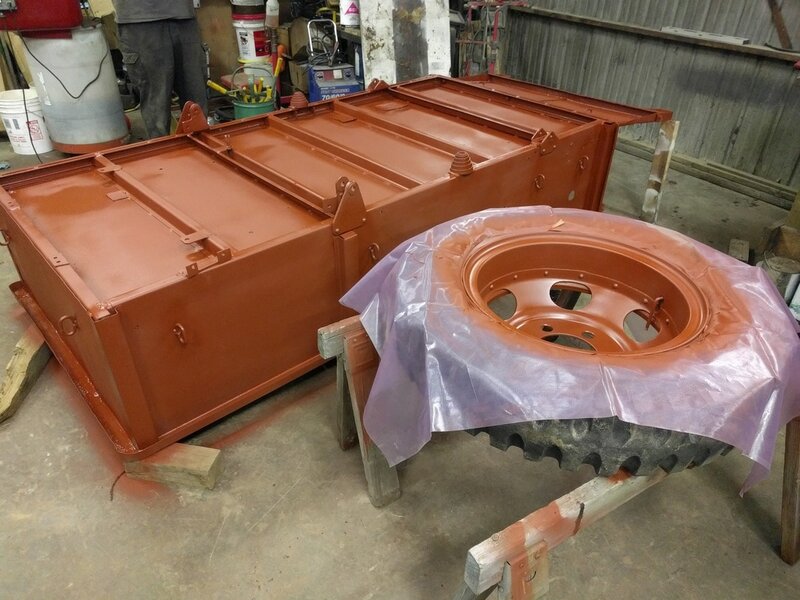 Pull the fenders and get some red oxide primer on in. Making progress! The trailer was flipped to work on the bottom. The wiring was removed at this point. 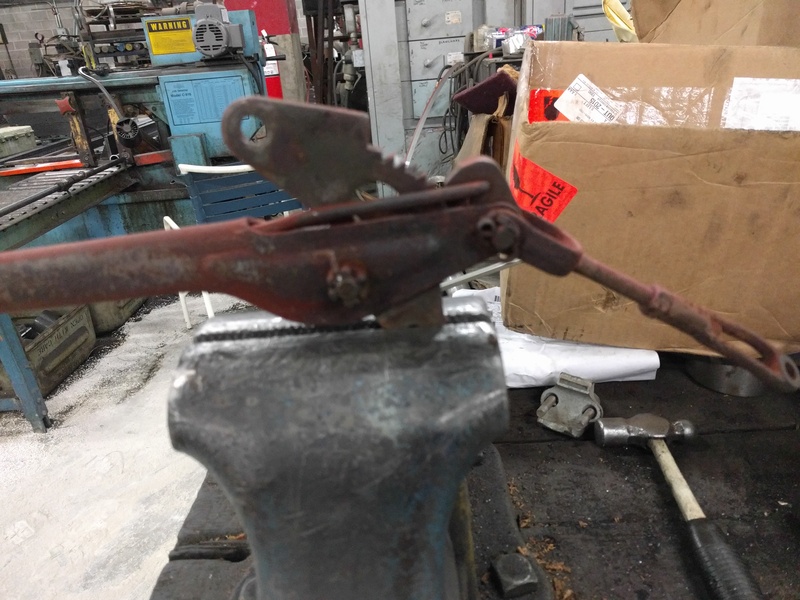 We used a torch to cut off the modern ball hitch assembly. More grinding to follow of course. 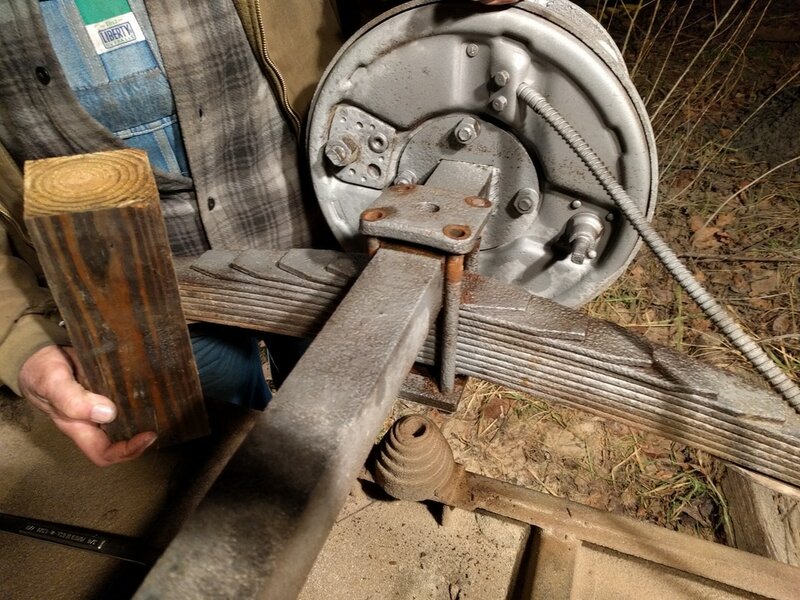 This is in preparation of using the original style pintle mount. 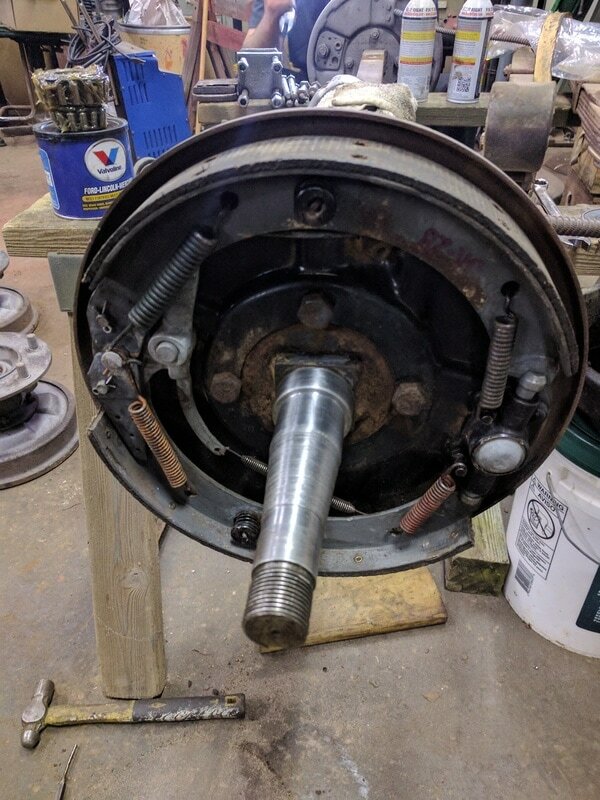 The ebrake assembly was locked up tight. 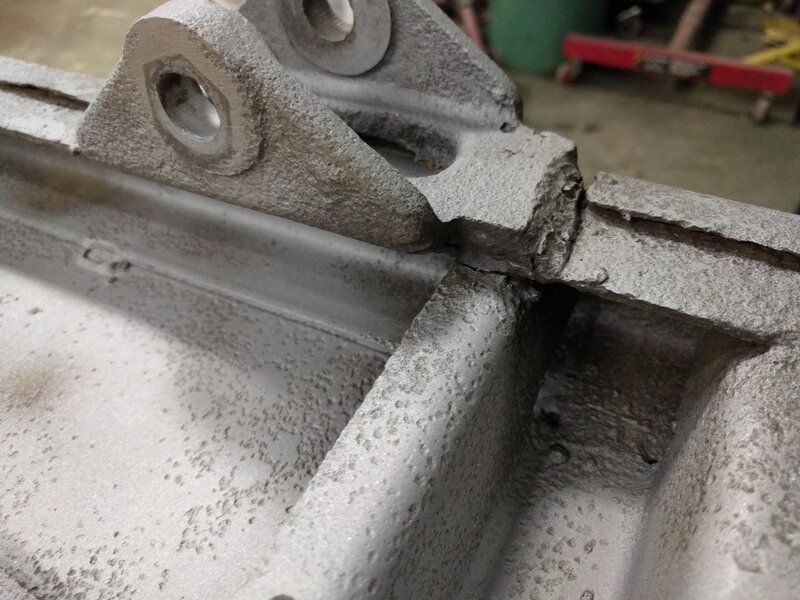 With some penetrating oil all of the bolts came loose without breaking off! I pulled it off for further servicing. 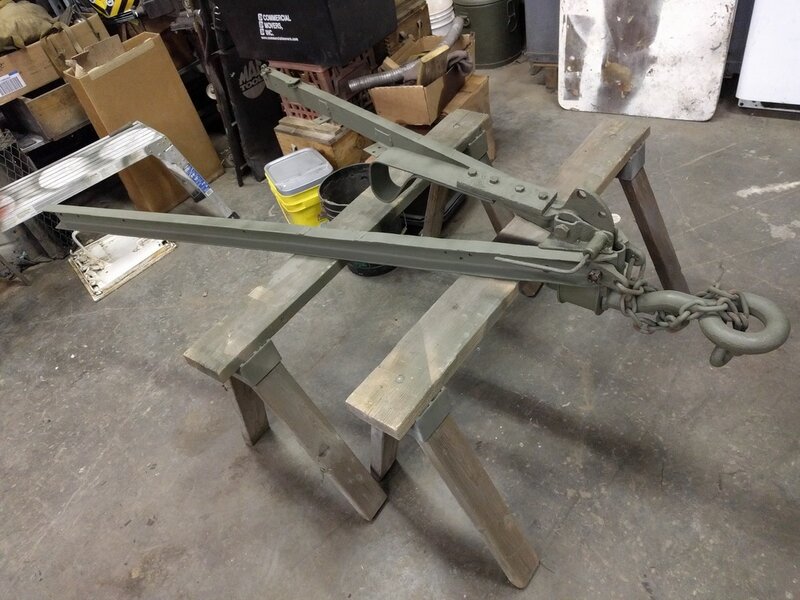 Here are the frame rails from the trailer. 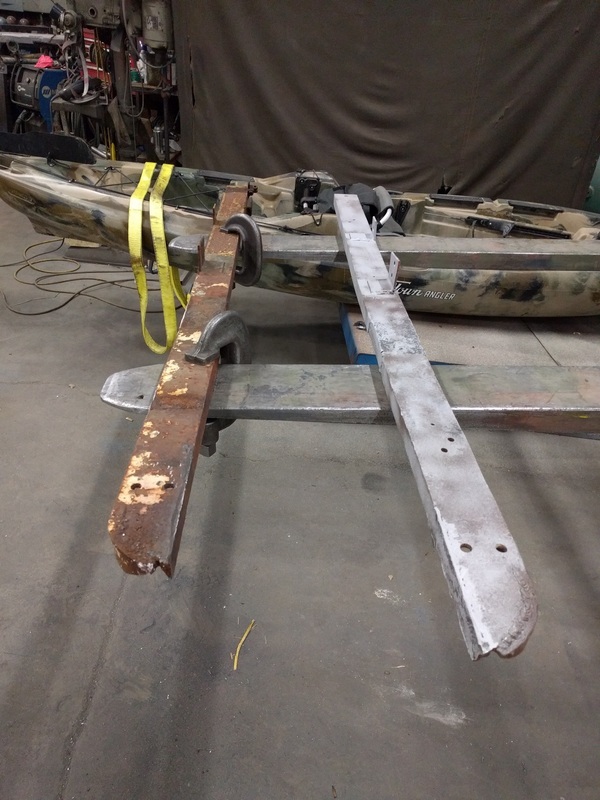 The rest of the old brackets have been removed and some sandblasting took care of the years of rust. ​Take a look at this beauty! 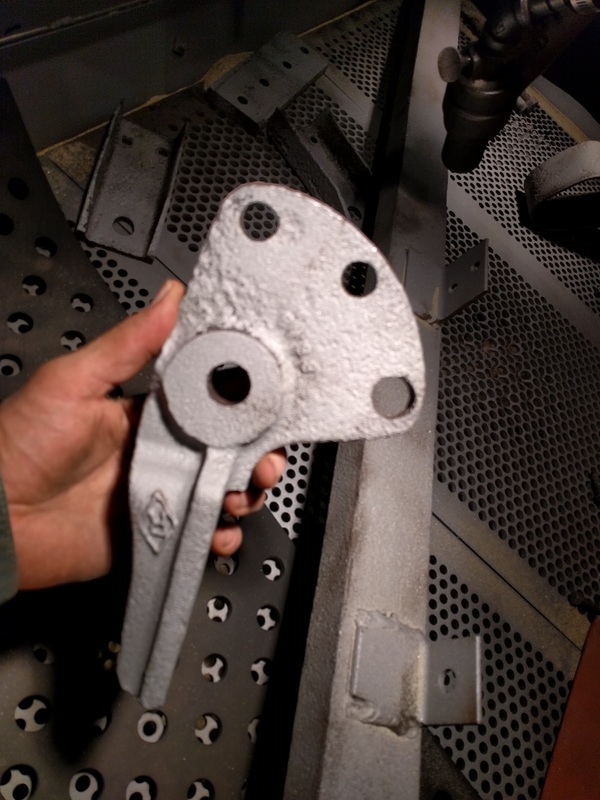 Here is part of an original pintle assembly. 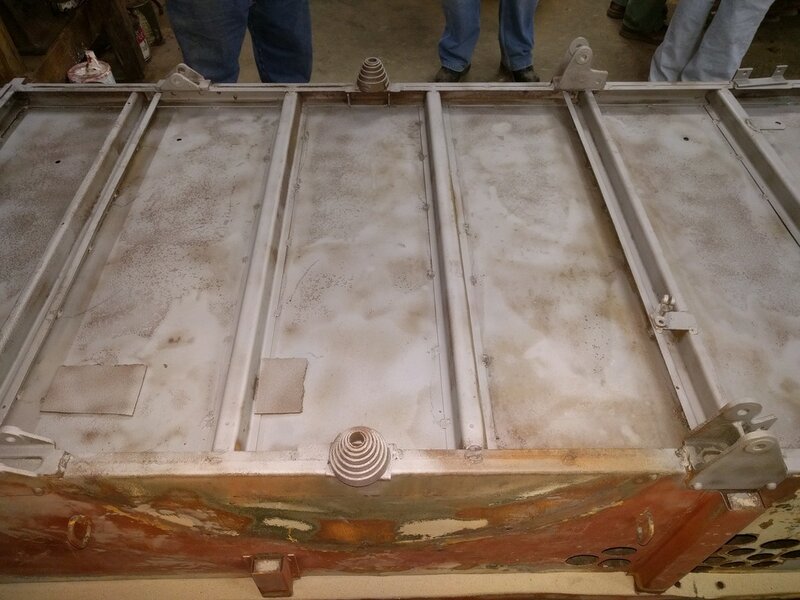 The whole assembly was in terrible condition, but bringing parts back to life is what we do. Here is another part of the pintle assembly. Pitted? Yes. Going to use it? Oh yeah! The casting was thick back in the 40s and it will have plenty of life left. TIme to get some primer on these parts. ​The hand brake lever is really locked up. We are trying to free it up without destruction! 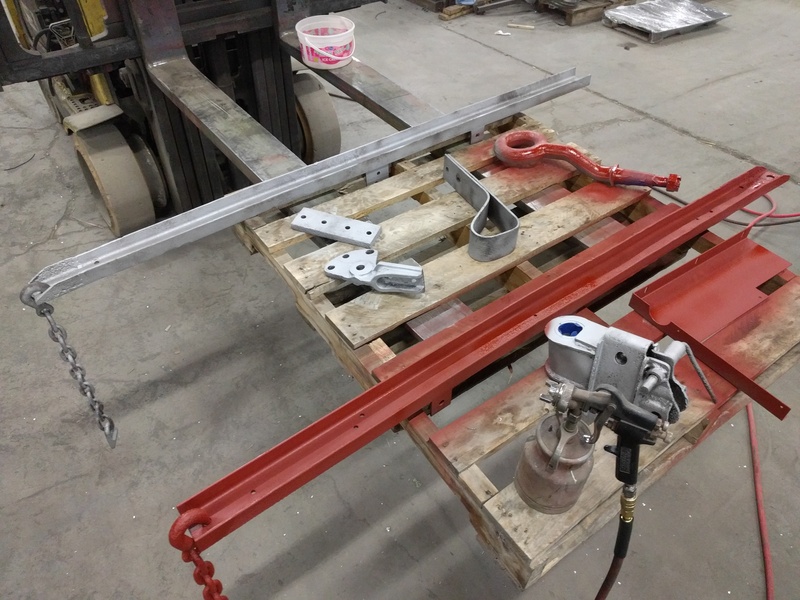 Here is the frame assembly with the new (new to this trailer, anyway) pintle hitch. Note that the assembly is upsaide down on the saw horses. 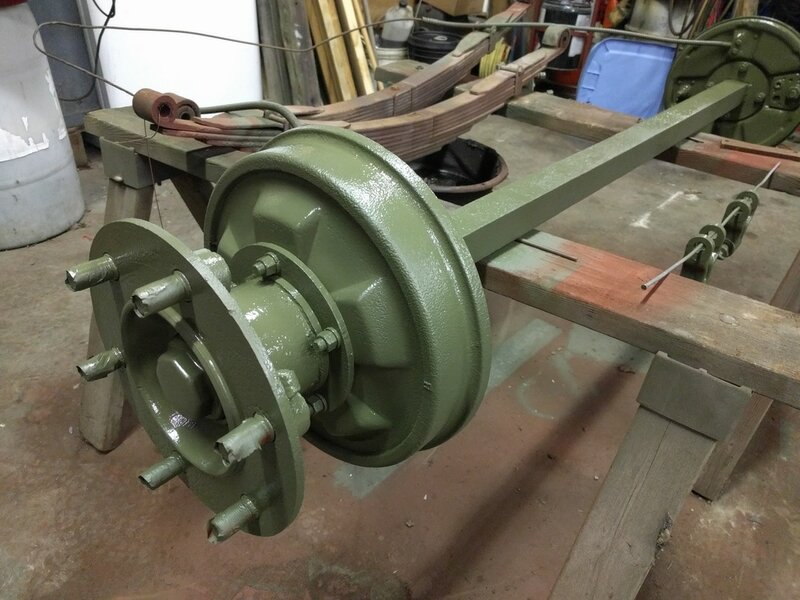 The axle assembly was sandblasted and removed from the trailer body. The original hardware is in pretty good shape, even after all these years. 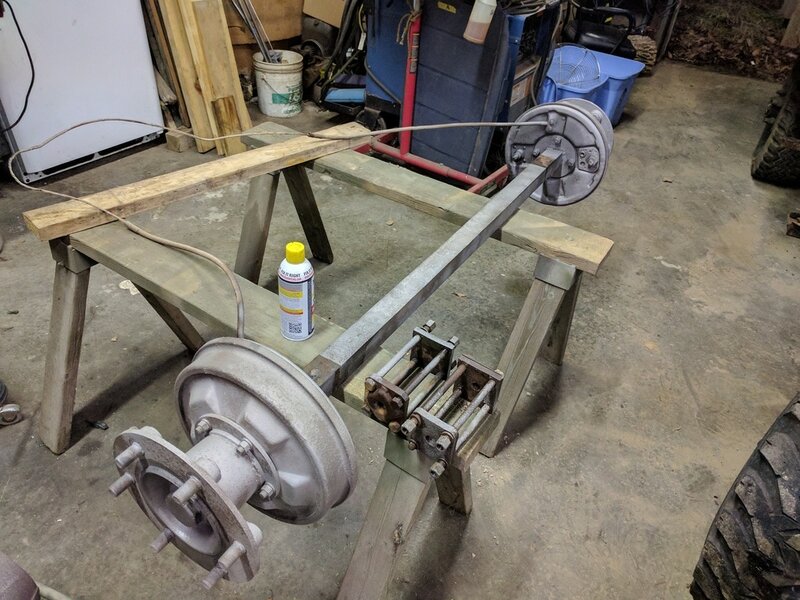 The Ben-Hur axle. Looks heavy, is heavy. Wintertime often means working in the dark. 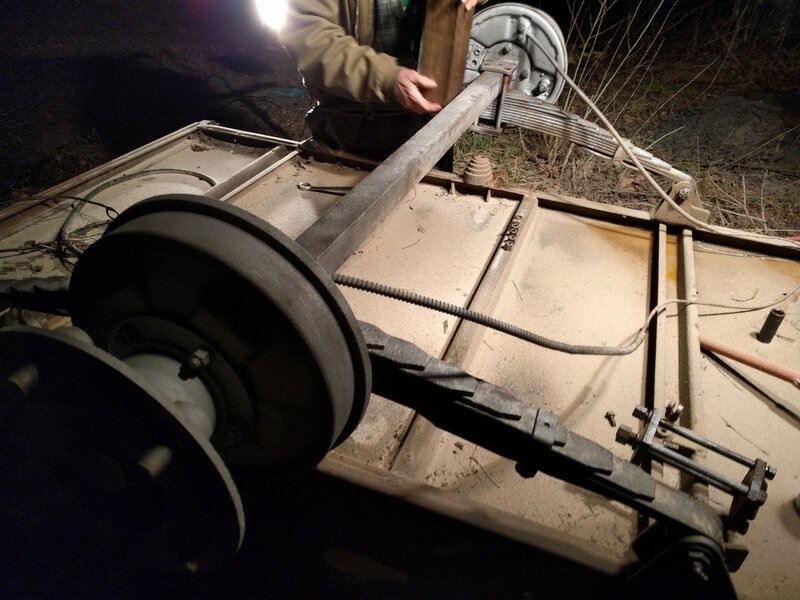 Here we have lights set up as the axle and springs are removed from the 1 ton trailer. Lots of dents to straighten out. 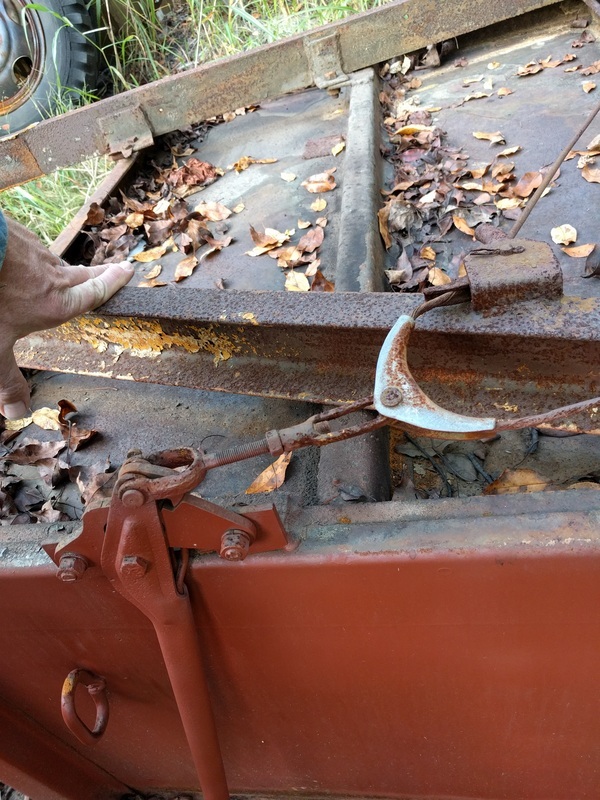 Nice thick metal on this trailer! The original bearings are in great condition! Maybe original grease even? This is what it looked like as the drum came off. 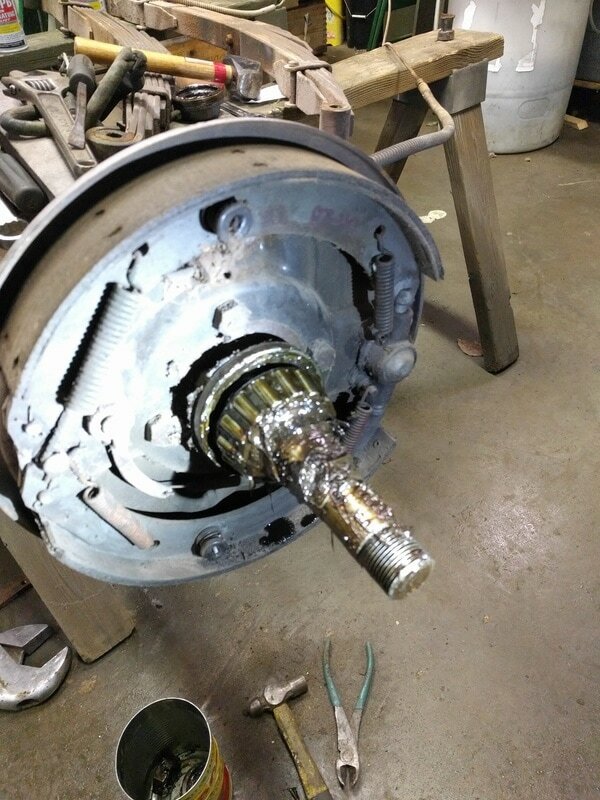 The entire brake assembly is also in fine shape. This is what built to last looks like. Cleaned and ready for reassembly. Note the freshly packed bearings about to go back in. 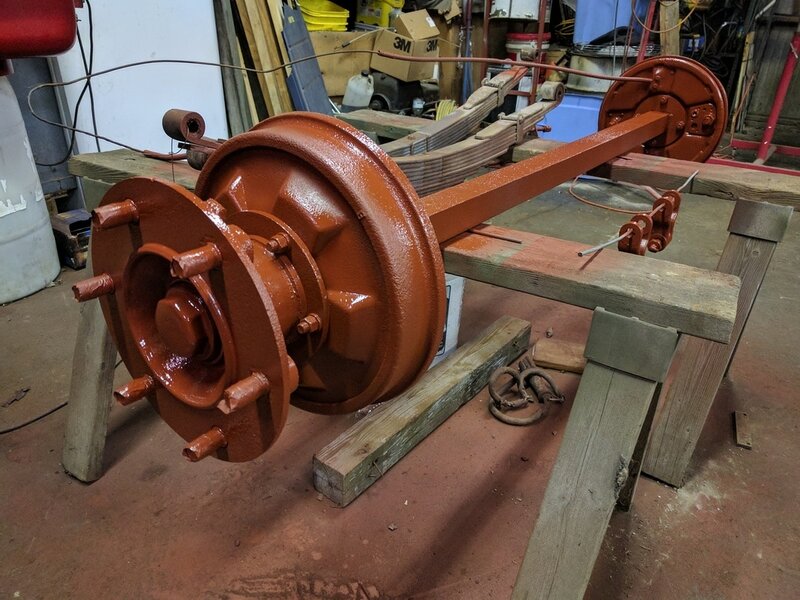 The axle assembly cleaned, reassembled, and primed. More damage to the fenders to work on. 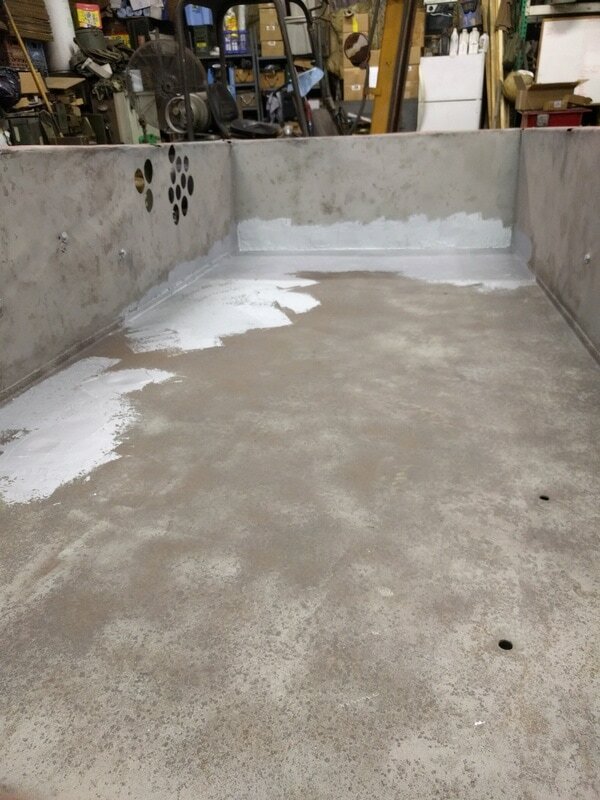 Here is the bottom after the initial sandblasting. Pretty solid. Looks like some cracks around the leaf spring mounts. 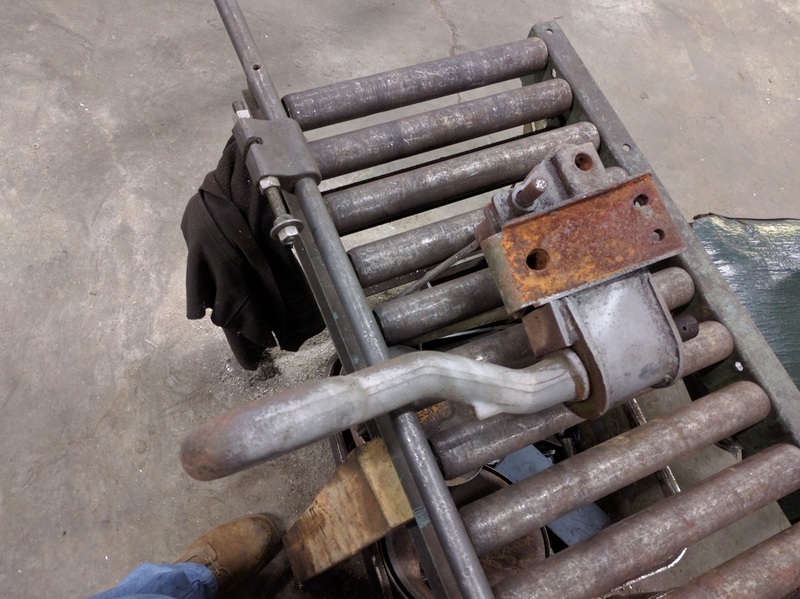 To be welded up of course! 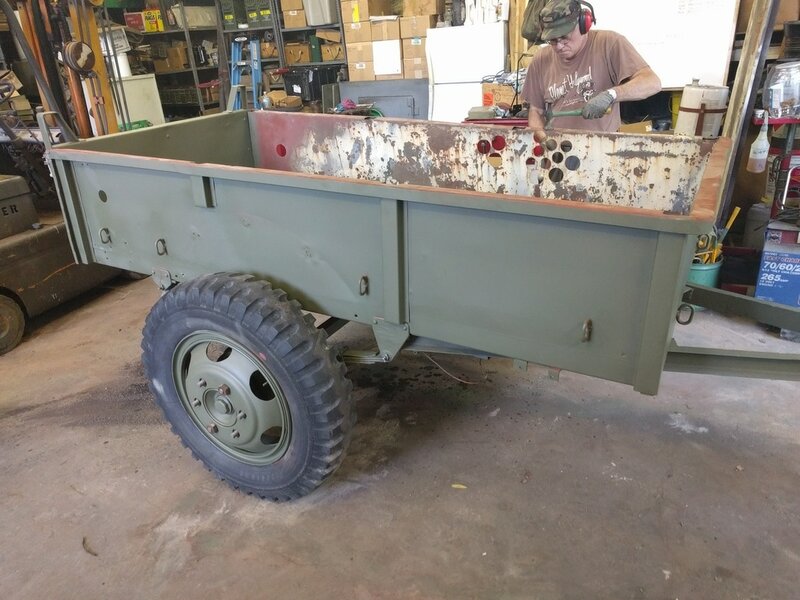 Primer on the trailer at last. 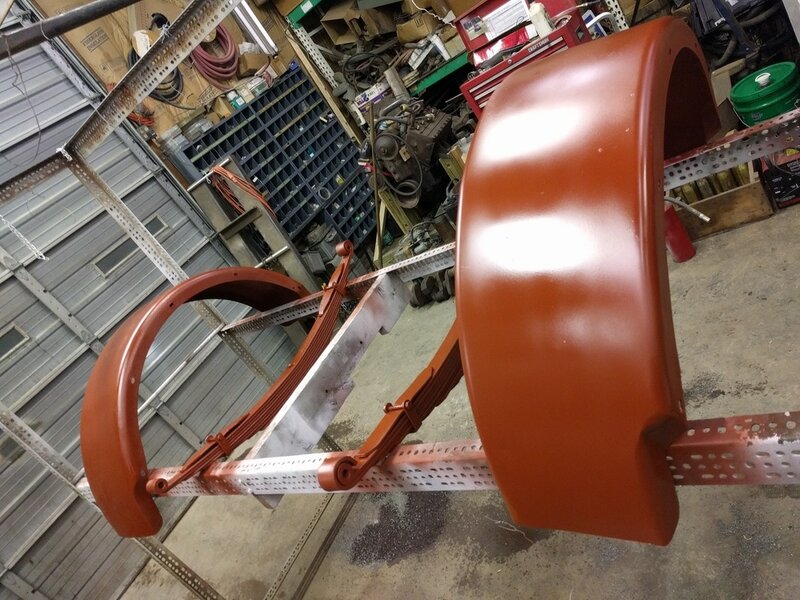 The fenders got some further metal work. First hammered back to near smoothness, then some ripped out holes welded back. 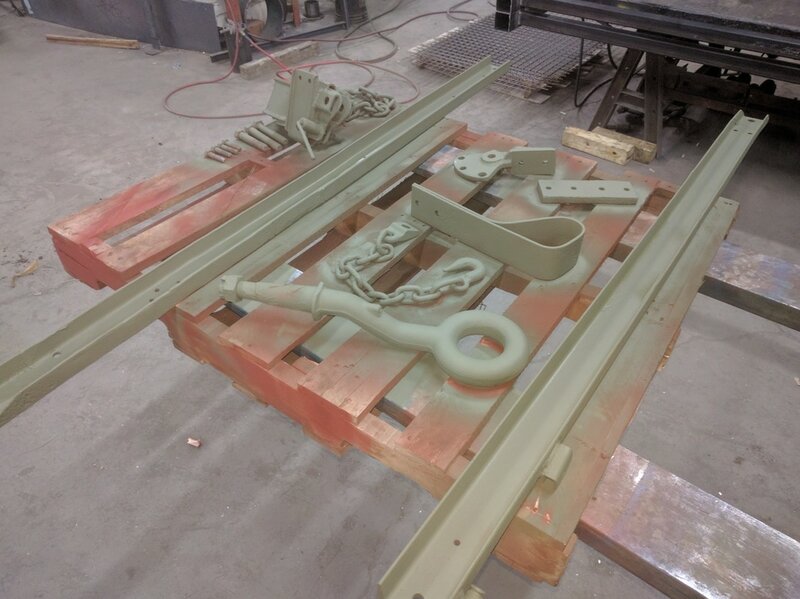 Finally these will be blasted, primed, and painted. 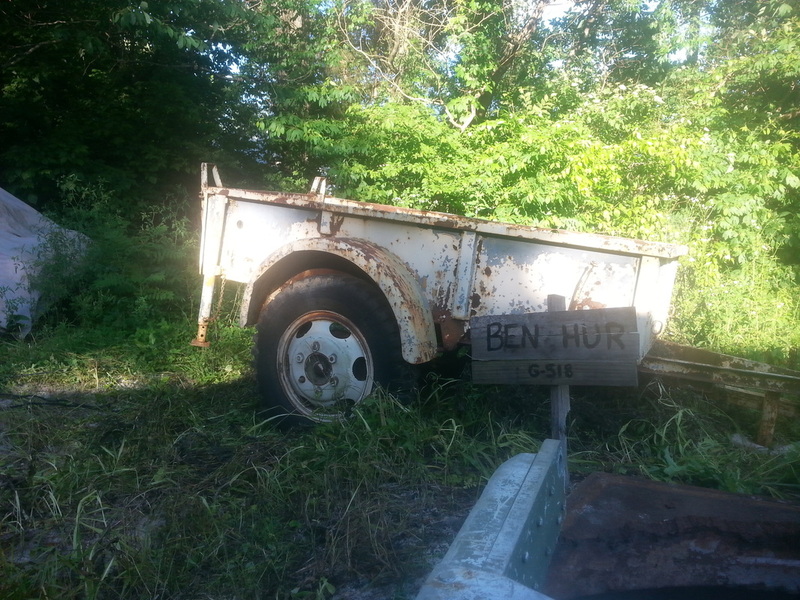 Green paint on the Ben-Hur trailer! 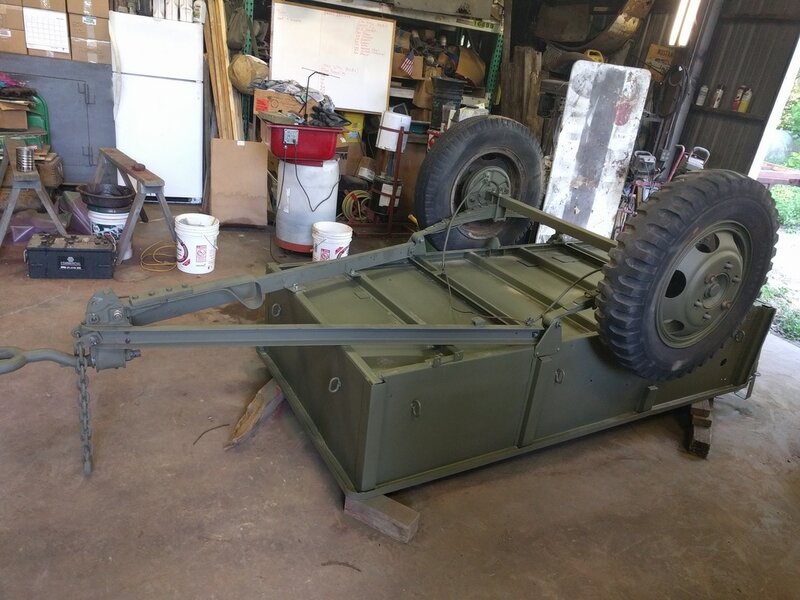 Springs, axle, wheels, tongue assembly all installed on the body. Got it right side up. I would hope that it never goes upside down again for the next 75 years. 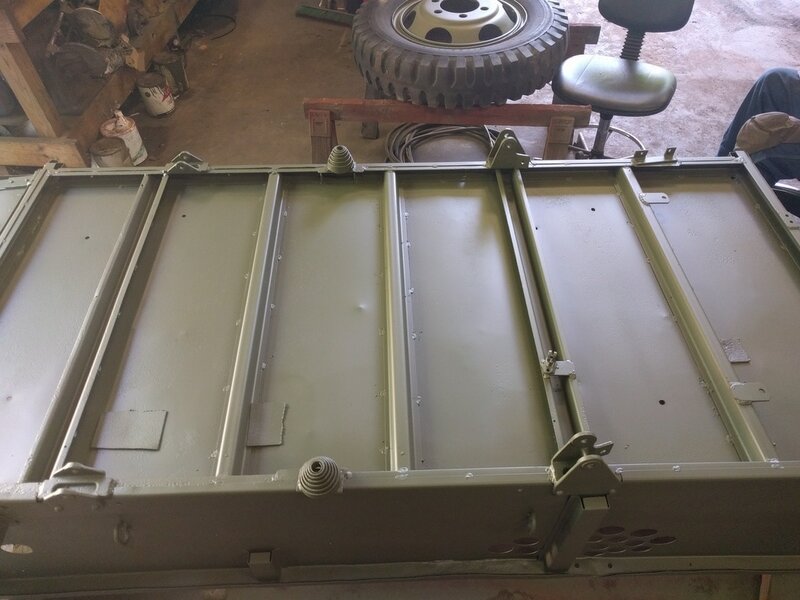 Still a bit of metalwork to do and still some sandblasting on the inside. Of course the wiring, e-brake, light, and final paint will be done. 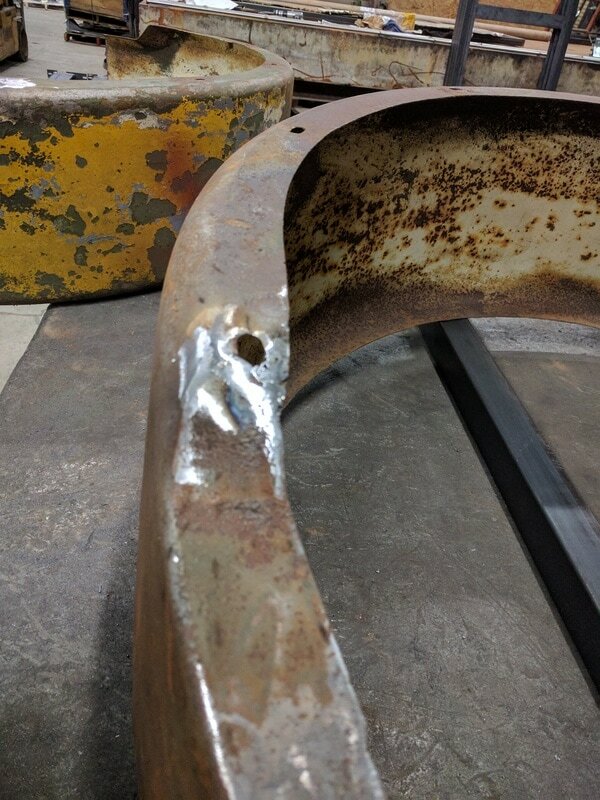 Some 'All Metal' filler was used to fill in some of the worst pitting on the trailer. The way it sits the front is a bit down so it holds water. And wet metal loves to rust! Green paint all around! The fenders are also installed in this picture. The trailer is nearly done at this point. Lots of detail work left to do, but it is now usable. 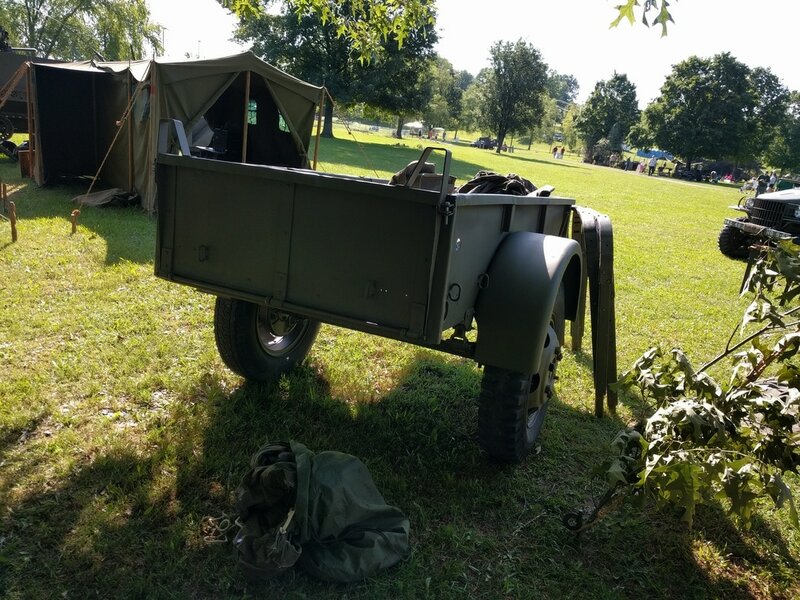 The Ben-Hur 1 ton trailer at it's first event. 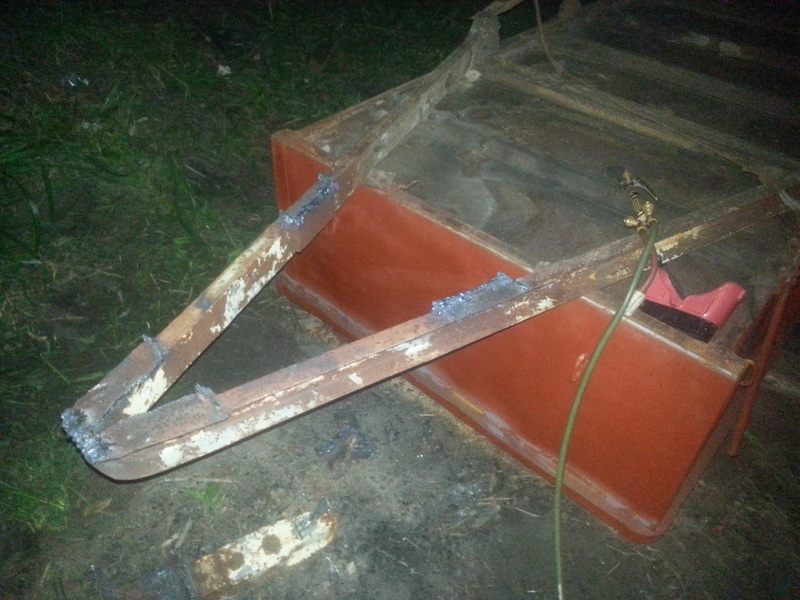 We used it to hold a bunch of stuff at the encampment. I was pleasantly surprised by how much attention that it drew.